One of the glaring omissions in my life as a cinephile is an unfamiliarity with Hou Hsiao-Hsien, the Taiwanese director hailed as one of the greatest filmmakers of my lifetime, most notably in America for A City of Sadness and Flight of the Red Balloon. This year, Hsiao-Hsien won Best Director at the Cannes Film Festival for his martial arts tale The Assassin (which plays at the Gene Siskel today and tomorrow.) Well before The Assassin was finished, I fully understood the basis for Hsiao-Hsien’s acclaim. Rarely have I seen a director work to create such beauty. Hsiao-Hsien fills the frames of his saga of eighth-century China with beautifully arranged images of landscapes, palaces, and country roads, and then uses his camera not for static or traditional panning shots, but elliptical shots that lazily travel through the scene and return to the same spot. He wants the audience to be fully immersed in the environments, filled with costumes, weapons, and architecture recreated to the last period detail, and notice all that is happening in them for The Assassin is a film of visceral thrills. The elegiac calm Hsiao-Hsien creates is continually shattered by violence, and the audience never predicts when the next battle will occur (in what I think is a great metaphor for our own time). 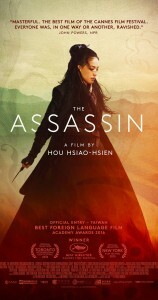 Moreover, while the calm parts of The Assassin offer some of the most gorgeous visions of the year, such as the transition from the black-and-white opening sequences to lush color and a pivotal scene in which two characters have a meeting atop a mountain slowly enveloped into invisibility by fog, the action scenes are shot with the same poetry. These are brutal, deadly fights with swords, arrows, and the human body itself as weapons, but Hsiao-Hsien films them without showiness, letting the precision of the fighters’ movements provide speak for itself. It helps that he has cast veteran film star Shu Qi as Nie Yinniang, the eponymous assassin. Yinniang is a standout in a year already filled with great female leads. Played by the seemingly ageless Qi, the assassin is as quietly ruthless and cool as an Eastwood or McQueen hero, but Yinniang also possess a sense of moral conviction that she cannot shake and separates her from the other characters, and her choices dramatically propel the film…at least that’s what I think. The Assassin has one gigantic flaw. Hsiao-Hsien and his three co-writers (and again, NEVER trust a movie with four writers) set up the plot in the first half-hour. Yinniang has been trained since girlhood by the nun Jiaxin to become an assassin, and while Jiaxin is proud of her student’s excellence, she recognizes that Yinniang lacks the ruthlessness necessary to become the perfect killing machine. Thus she sends Yinniang on a mission to kill Tian Ji’an, the leader of the upstart province of Wenbo that is rebelling against the Tang Dynasty ruling China. Tian happens to be Yinniang’s cousin, and they were betrothed as children until a family dispute led to the Wenbo split and Yinniang being sent to the mountains. These are the makings of a great costume drama with martial arts thrown in, but once all this has been established, The Assassin starts introducing a multitude of characters and subplots with barely any accompanying set-ups or dialogue, and what dialogue there is comes in between really long sequences of Tian and his party on the road escorting a traitor to the border. The film is so disorienting that by the end, my fellow moviegoers and I had no idea who was doing what to whom, or what was the identity of a mysterious woman in a mask fighting Yinniang, or who the old wizard is who casts magical spells and gets six arrows in the chest but still lives for at least a bit (because there’s magic, too), or why in the end Tian threateningly runs into a room ready to kill a woman and proceeds to simply wreck it like a college student on a drunken rager while she idly watches. Even the very last scene, which apparently represents a happy ending for Yinniang, is inexplicable. I have not been left so confused by a film since Primer, but I would still recommend The Assassin if only to delight in Hou Hsiao-Hsien and Shu Qi’s unimpeachable triumphs. Christmas is in three days. You may find yourself with a spare hour in the midst of the season, or your family may want to find something that isn’t twenty-four hours of the kid who wants a gun, or, and I hope this is not the case, you may have ended up with a mostly solitary holiday and want to lift your spirits. Netflix’s A Very Murray Christmas is the perfect watch for this week. Bill Murray, as inscrutable as ever in his choices, decided to make his version of old-school TV Christmas variety specials: excuses for a celebrity and various guests to sing songs and act in sketches of dubious quality, all connected by an ill-defined theme or plot. (One of the best examples of this is the full version of Bing Crosby and David Bowie’s “Little Drummer Boy/Peace on Earth” with its forced, scripted banter.) Since Murray is not only one of our greatest talents but also a personality so strong that everyone in a scene with him has to adjust, he is a natural choice for an awkward, goofy update of a Christmas revue. Indeed, there is plenty in A Very Murray Christmas that feels awkward by being gloomy and unsettling. An air of melancholy runs through the “comic” scenes, which are full of downcast, lethargic phrasing and timing. The musical numbers are shot with a lingering camera and never end when one thinks they will. What makes it work is that from his opening rendition of “The Christmas Blues” with loyal sidekick Paul Shaffer at the piano, Murray sets the tone and is firmly in control, veering between dry, sad humor and a return to his “Nick the Lounge Singer” persona from Saturday Night Live. It’s the last tone anyone would expect for a Christmas special, but the undercurrent of laughs comes from the multitude of guests having to play into Murray’s vibe, and the show’s heart comes from the brightening mood. 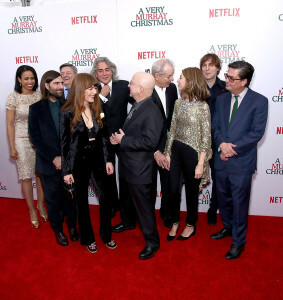 Indeed, A Very Murray Christmas is almost heartwarming. The “story” is that Murray is depressed. His live Christmas spectacular at the Carlyle Hotel is ruined by a snowstorm that halts all travel. But as Murray meets his fellow denizens, he brings them together for a celebration and some unexpected surprises. Murray’s subtle point is that thinking of and connecting with others, be they your closest friends and family or strangers, is what makes Christmas special. Although he keeps his Buster Keaton-esque stone face throughout, by the final scene Murray’s depression has abided for love, peace, and understanding. Murray’s Christmas escapades are filmed by Sofia Coppola, who works lush magic in the dimly lit Carlyle and delights in the bright, climactic dance numbers. The guests are well chosen, mixing fine comic actors with standout vocals from Miley Cyrus, Jenny Lewis, Maya Rudolph, and Phoenix (whose lead singer Thomas Mars is Mr. Sofia Coppola, prompting Murray’s slyest in-joke in the show). The songs are the best part: a mix of standards, modern Christmas tunes, and one bizarre non-Christmas number, with arrangements ranging from low-key to grandly swinging but all tied to Shaffer’s piano. The finest thing about the songs is the dedication the cast puts into them, no matter how silly or flimsy the excuses to sing them are. My three personal favorites include two performances of genuinely Christian songs: though Chris Rock adds a ridiculous air to “Do You Hear What I Hear?” Murray performs it with a serious reverence, and Cyrus delivers a show-stopping “Silent Night.” But the apex of A Very Murray Christmas, and the best reason to watch the show, is Murray’s “duet” with George Clooney, “Santa Claus Needs Some Lovin’.” Murray aims to recreate a very specific trait of old variety specials—the aging crooner attempting to get hip with 60s and 70s rock sounds—and nails it in a glorious bit of clowning that is our latest reminder to never count Bill Murray out. 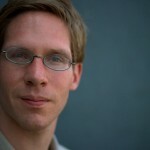 Pictures from Indiewire, The Telegraph, Zimbio, and Pink is the New Blog.